Antisemitism with Jeremy Corbyn, anti-Islamism with Boris Johnson: how do they compare? This post is not about the issues themselves but about the way they are being publicly debated and what this tells us about our declining public ethics. All the way from the Daily Mail to the Guardian, despite the exceptions there is remarkable unanimity in the public narrative. Anti-Islamic sentiment in the Conservative Party and antisemitic sentiment in the Labour Party are proper matters for debate, in and beyond those political parties and religious communities. They should be taken seriously in their own right. Instead they are being reduced to character judgements about individual politicians. Either of those men could become the next Prime Minister. It is as though the significance of the issues is being reduced to what they say about these individuals. Serious debate about the ethical standards of our society gives way to celebrity gossip. The way the chattering classes depict these men is informative. Corbyn is depicted as a man of moral seriousness. He has a long political record showing consistency of commitment. He seeks change, and is therefore depicted as dangerous. Boris is depicted as a man of fun. He is good for a laugh. 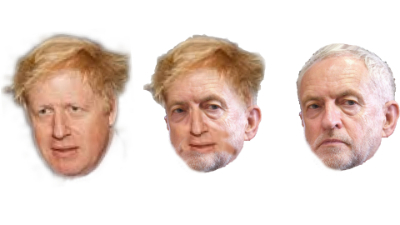 While Corbyn tells us what he would do as Prime Minister, we don’t know what Boris would do. Does it matter? From the point of view of the political establishment, not really. He’s one of us. It’s as though we don’t take Corbyn seriously because he’s a serious man. We can take Boris seriously because we can’t take him seriously. He’s the kind of leadership figure we want. Corbyn supports the Palestinian cause against the Israeli Government, and this makes some people want to treat him as antisemitic. The case against him is that, although he did expel Ken Livingstone, he hasn’t done enough to tackle antisemitism in the Labour Party. He wants to play down the debate; it is kept going by his opponents. It is as though nailing Corbyn has been something of a struggle. One cannot help suspecting that they would have preferred to unearth some financial irregularity of his, or an adulterous affair with someone interesting; but, dammit, the worst they can find on him is this antisemitism stuff. Boris, far from wanting to play down the anti-Islamism issue, goes out of his way to liven it up. His language of ‘letter-boxes’ and ‘bank robbers’ draws attention not only to the issue but also to himself. Perhaps he has learned from Donald Trump that the more outrageous he is, the more politically incorrect, the more emphatic about not caring about the effects of his words and actions on his victims, the more the voters will love him. So while Corbyn struggles to defend himself against the accusation of being soft on antisemites, Boris struggles to attract the accusation of being anti-Islamic. Even so, the dominant narrative is that he isn’t really committed either way on anti-Islamism: he just wants to attract attention to himself because he wants to become Prime Minister. Far from being outraged that a senior politician should behave like this, the chattering classes invite us to enjoy it. What bothers me most about this is the way political discourse is being redirected. Moral seriousness is out, light-hearted joking is in. Even when important issues are at stake. I am not claiming that these character representations are true. I guess they are partly true, but exaggerated. Whether or not this is the case, my concern is that this kind of political discourse undermines democracy, freedom of speech and political discourse itself. Usually, we are governed by mixed bunches of people – some Borises, some Corbyns, some in betweens. How well we are governed depends on how well they filter out the nonsense and allow themselves to be guided by a moral commitment to the common good. It is as though we have lost this compass. We no longer expect our politicians to solve our problems. All we expect from them is entertainment. Is this because all the commentaries come from comparatively well-paid people who don’t want change? Or from the people behind them, the newspaper owners and the people who work out the Google and Facebook algorithms to maximise company profits regardless of the effects on democratic debate? I don’t know. What I feel more sure about is that, if we carry on like this, we’ll end up with a ruthless tyranny. In a culture that abandons moral commitment, neither democracy nor freedom of speech can survive. When societies lose their moral consensus, they collapse. We need to be governed by people who do what they do because they think it is right. We need to be informed by people who say what they say because they think it is right. Nobody gets it right every time, but we should expect at least this. There is no substitute for moral commitment. This entry was posted in Ethics, Politics, Society and tagged anti-Islamism, antisemitism, Boris Johnson, Jeremy Corbyn, morality, Political Ethics, public ethics. Bookmark the permalink.